There is so much fantastic looking salmon in the market this time of year. Asparagus is also all over the place. Recipes combining these two lovely spring ingredients can be found in many books, sites and on restaurant menus. 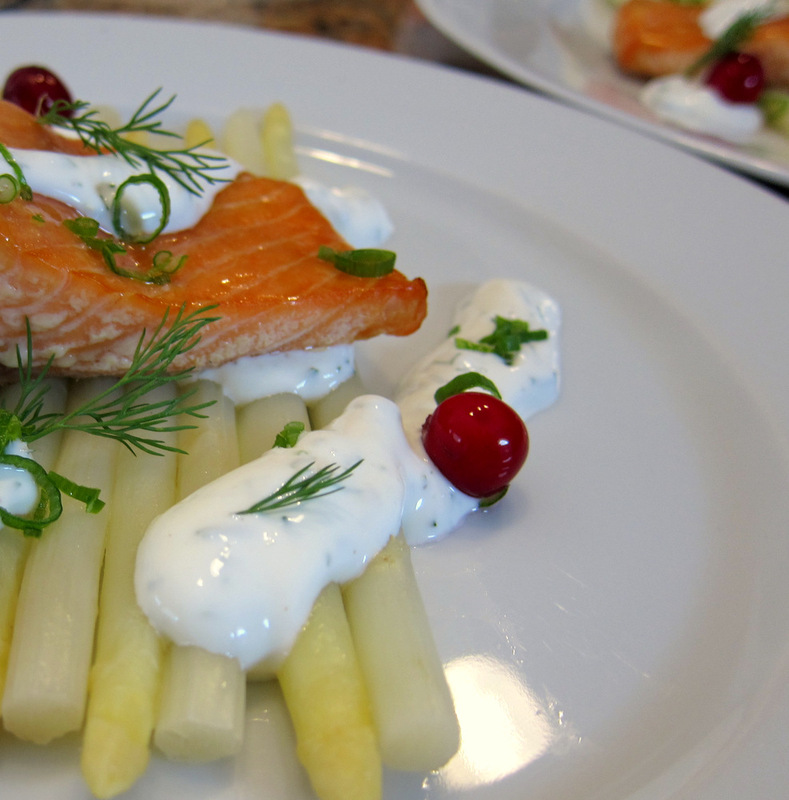 This recipe based on one from the book Neue Cuisine: the Elegant Tastes of Vienna by chef Kurt Gutenbrunner uses salmon that gets lightly smoked and serves it with the classy white asparagus and a sour cream sauce. It hits all the right buttons. The flavors are harmonious and robust and the plated dish looks refined even though it is very straightforward to prepare. 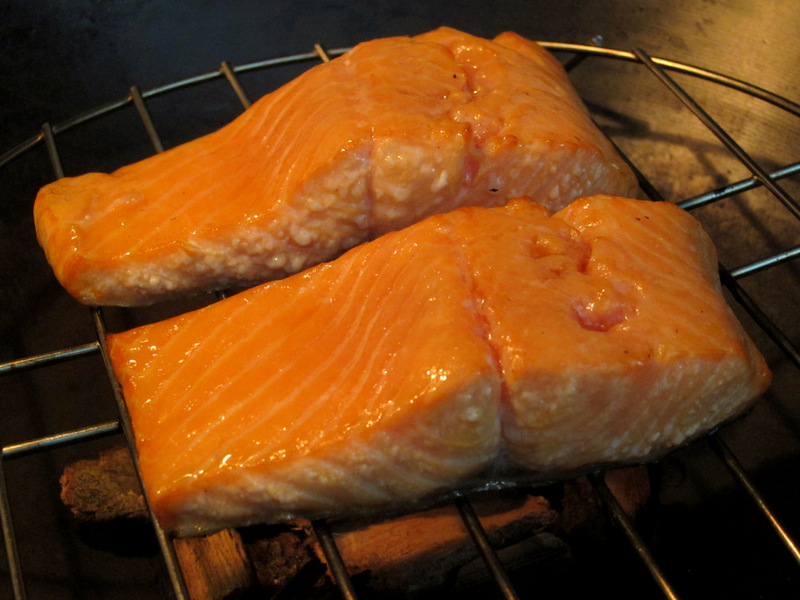 The fish is cured lightly and then smoked. 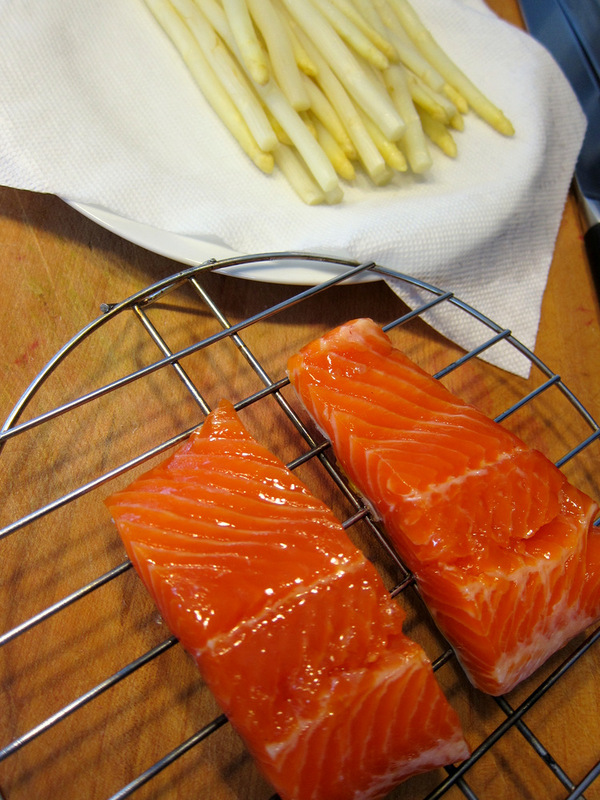 You really do not need a major rig to hot smoke a few pieces of fish at home. I use an old wok following a method that I learned years ago from Barbara Tropp’s book China Moon Cookbook. To smoke the fish (or Chinese-style steamed duck or chicken) put a rack that fits in the wok but remains several inches above the bottom. Oil the rack a bit so the meat does not stick and then put the meat on the rack. Put in some wood chips in the bottom of the wok and any other aromatics you like and allow them to start smoking over high heat. Close the wok with a tight lid and smoke the food as long as needed over medium heat. That’s pretty much the exact process chef Gutenbrunner uses in this recipe. 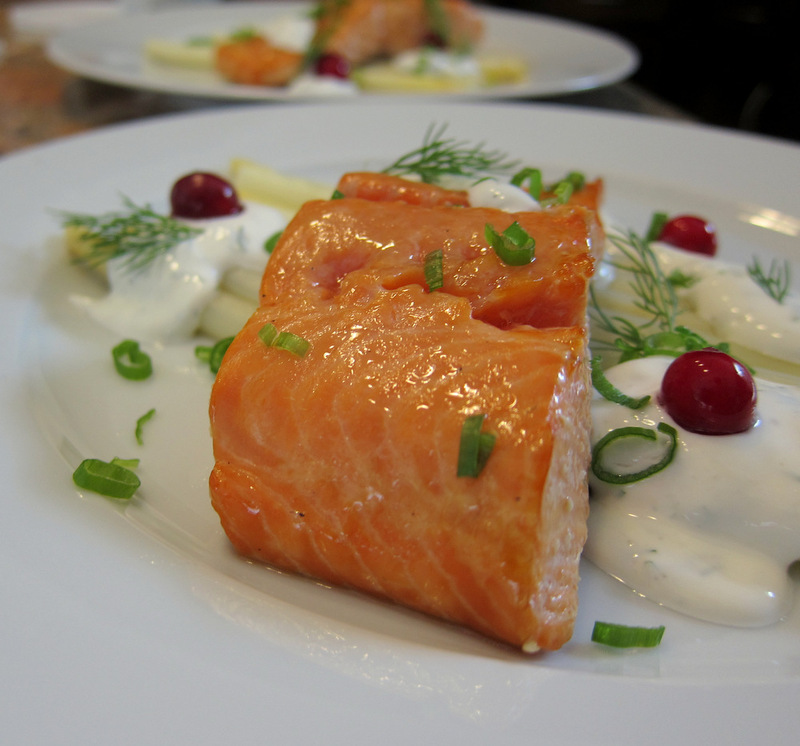 The salmon takes maybe 20 minutes or so. Before smoking the salmon I wanted to make sure it comes out well seasoned and juicy so I cured it lightly. All that means is that I sprinkled the fillets with a mixture of salt and sugar, about a third sugar and two-thirds salt. These then sat for about 30 minutes as I prepared the rest of the meal. I then rinsed the fish and patted it dry. It’s amazing that in only thirty minutes the difference can be both felt and seen. The fish is firmer and has a nice gloss on it. 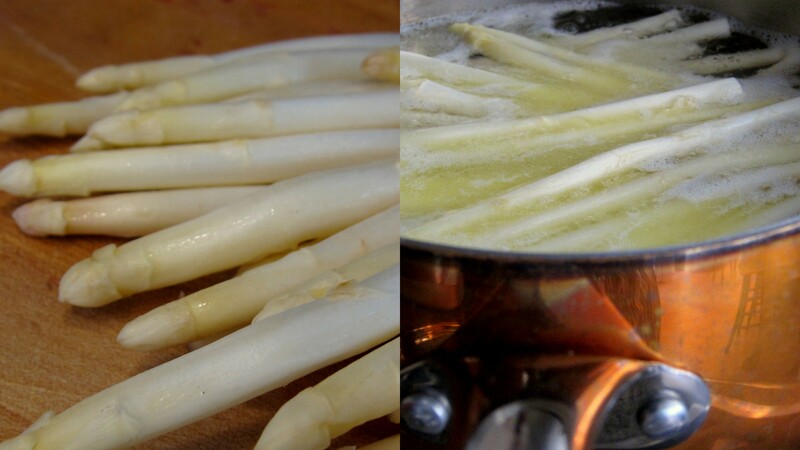 I cooked the asparagus simply in a pot of water with salt and butter and kept them warm until dinner. I really should’ve peeled the bottom of the stalks a bit since the bottoms were a bit woody on the outside. The red orbs in the picture are the Vattlingon. I read about these in the book Faviken by chef Magnus Nilsson from Sweden. He puts up lingonberries in a jar with water and puts them away for a few months. Following Hank Shaw’s idea to use cranberries instead (he serves them with salmon as well) I put some up back in the fridge around December so they are ready about now. 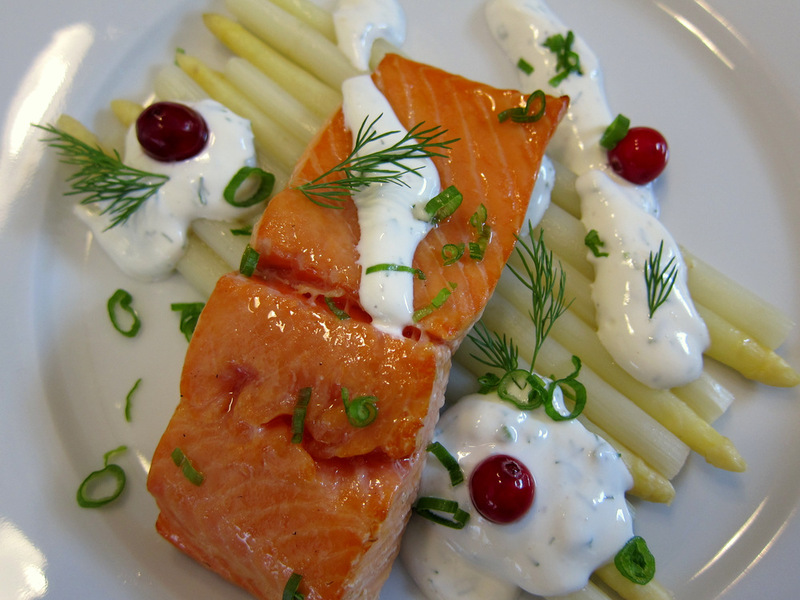 The sauce is sour cream, dill, chives and some lemon juice. Some more of those cranberries would’ve been good on each plate, but other than that the flavors were spot on and the plates looked lovely. I love hot-smoked salmon. Your photos are beautiful. I was wondering what Vattlington are, but now I know. Thanks Stefan. I am fascinated by these long (but very easy to do) fermentation/curing projects like Vattlingon. I only wish I had used a few more berries in this dish. Now that the batch is finally ready to be used I’m going to try them in more dishes.